Many people think of change as a fluid and hard to define phenomenon. The reality is that change can and should be managed in a systematic and strategic way. In the face of change, every organization has to consider 5 critical factors and how they are affected. 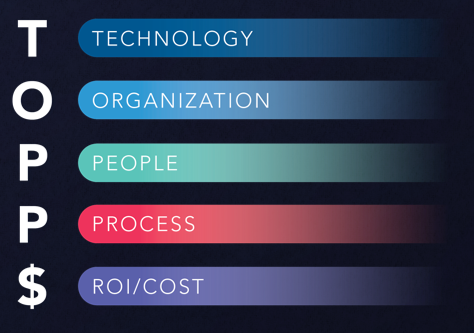 We call them TOPP$ — Technology, Organization, People, Process and ($) ROI/Cost. At Cordicate, we look at each of these components, both individually and from a holistic view, on every engagement. We make it our business to understand the impact and interplay of each and we align all the key stakeholders using these factors to guide the project. Continually viewing the project through this lens provides a common framework for managing and measuring the impact of change, for guiding strategies to stay ahead of it and significantly increases the probability of success. We’ve seen it first hand and our clients have felt the impact.